In June, the University of Oxford’s WWI Centenary Programme announced a competition, supported by the Van Houten fund, TORCH and Academic IT Services, that invited students, early career researchers and college, library and museum staff to create a blog post or podcast that presents a new perspective on the First World War and its impact on the University. 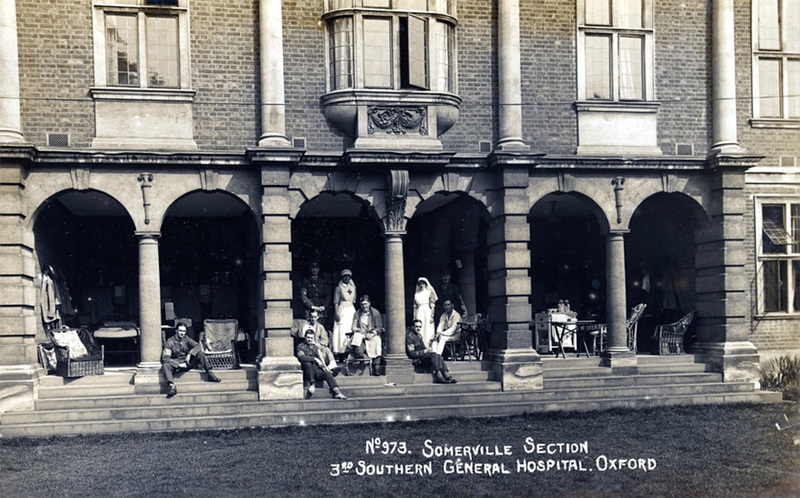 Somerville’s Librarian, Anne Manuel, and Communications Officer, Sarah Hughes, worked together to recreate some of the iconic photographs of Somerville from the First World War when it was being used as a hospital. 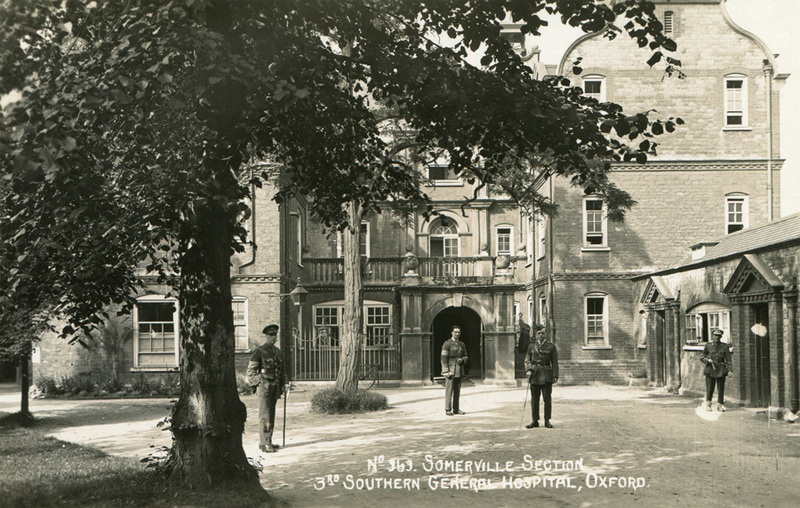 During World War One Somerville College was taken over by the War Office to become part of the Southern General Hospital housing convalescing soldiers. It was situated next door to the Radcliffe Infirmary and was therefore eminently suitable for such use. At first all ranks were accommodated here but latterly, the individual rooms, leafy grounds and large dining hall led to it being reserved for officers. The grounds were used for fresh air and exercise and large tents were placed in the main quad to maximise the accommodation available. The women students were evacuated to Oriel College most of whose students had left to serve on the front line. The few that remained were sectioned off from the women by a hastily-built wall. 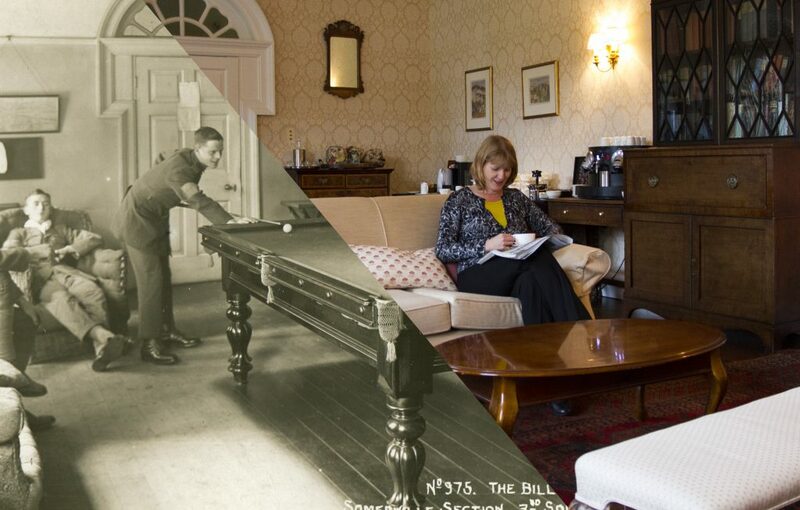 During this period, a series of professional photographs were taken of the College as occupied by soldiers and some of these are reproduced below with their modern day counterparts. 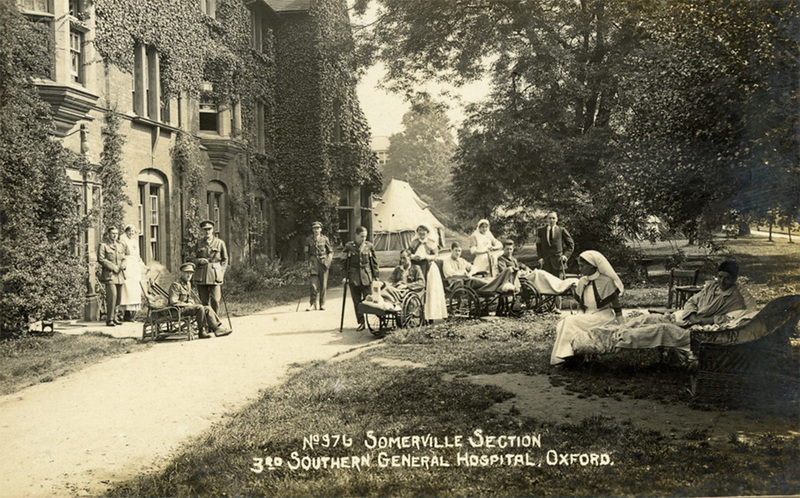 Postcards of many of these old photos are available from the Somerville College Lodge. This photo shows the old main entrance to Walton House complete with a few of its military inhabitants. To the right, beyond the College boundary, was the Radcliffe Infirmary. 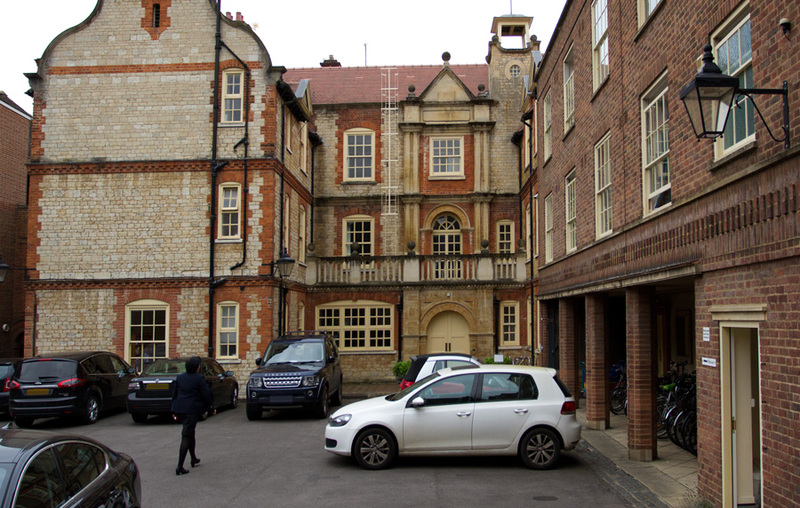 It was the close proximity to this hospital which made the College suitable as a convalescent home. Today the trees have been cut down and this area is used as a carpark for Fellows of the College. 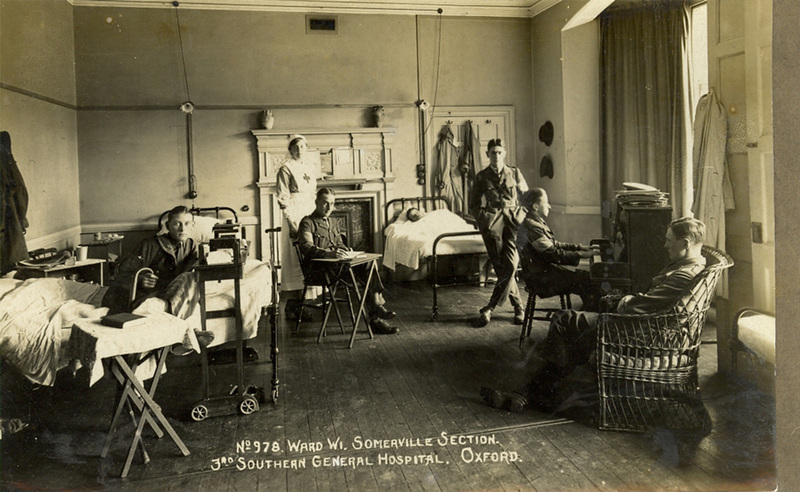 The War Office took over the College in April 1915 and initially the Dining Hall was converted into a ward. 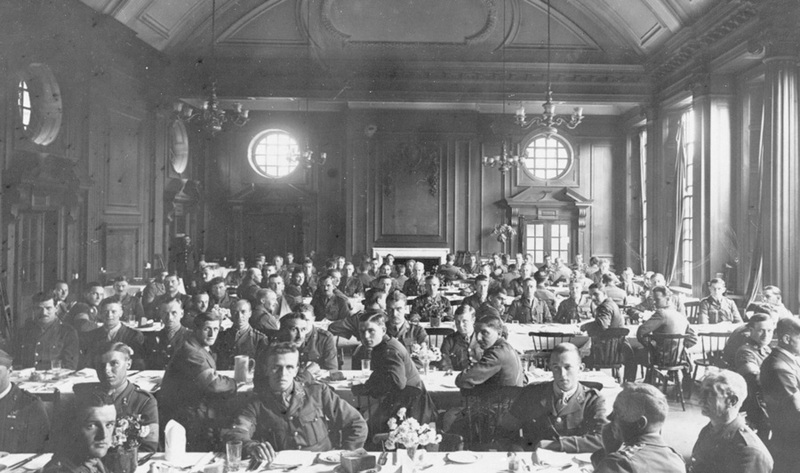 In 1916, the Somerville Section was designated for officers only and the Hall was returned to use as a dining room or officers’ mess. At the end of the war, a notice was found posted up in the Hall: “Officers are requested not to throw custard at the walls”. 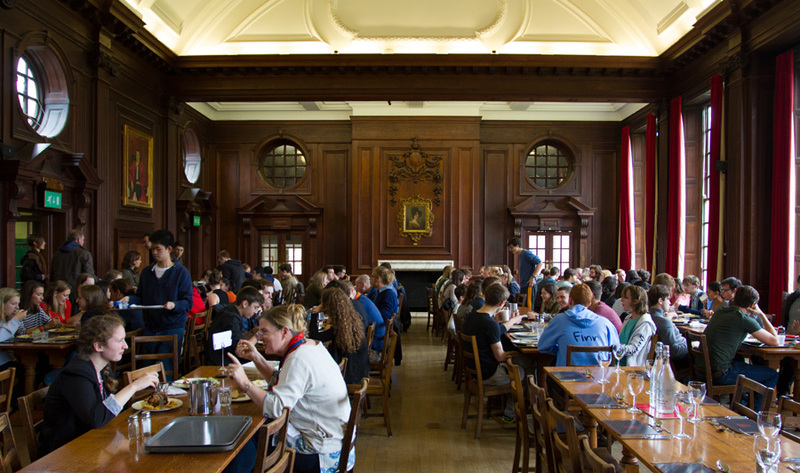 The Hall continues to be the College’s main everyday dining area with formal dinners being held here once a week during term time. It is still forbidden to throw custard at the walls. Somerville’s library was completed in 1903, with rooms for accommodation on the ground floor and the books occupying the upper storey. 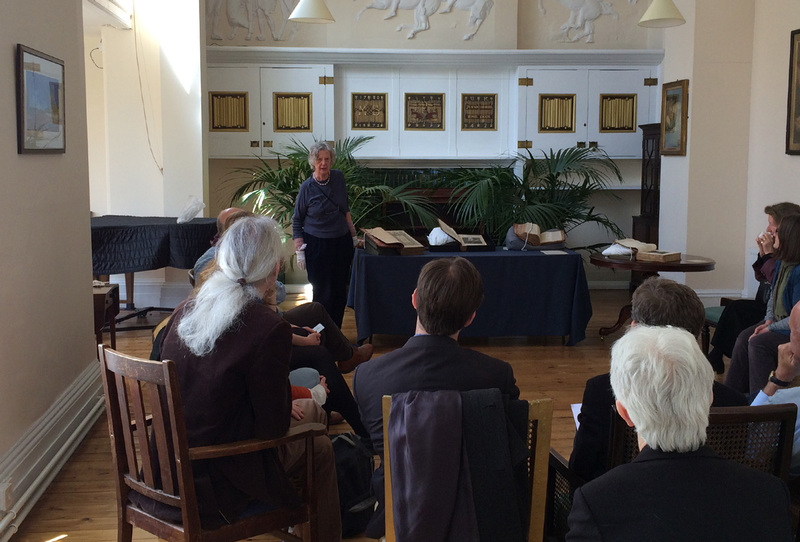 Books were fetched and carried by the librarian to Oriel College, where Somerville College was based during the war, for the use of the women students. 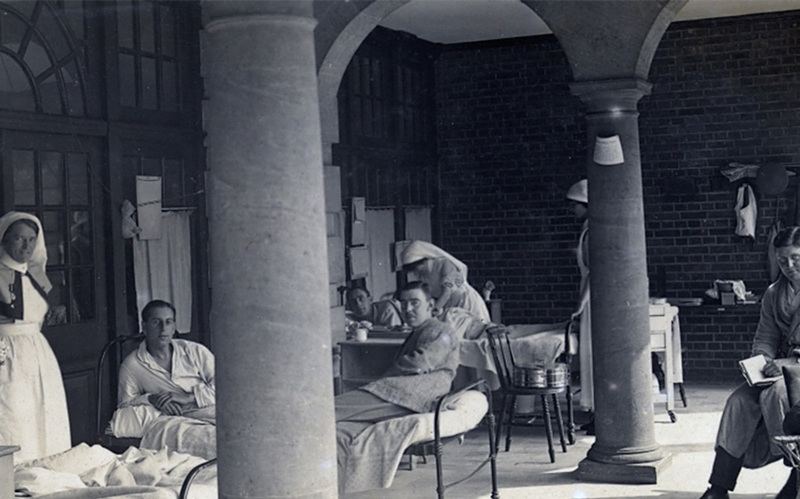 The Library itself was off-limits to the servicemen recuperating in the College although the sheltered loggia at the front was used as a daytime convalescent sitting area. The Library continues to be a popular place for Somerville students, a focal point of the College and the backdrop to many a student selfie. The interior of the loggia or library balcony. The loggia is now glassed in but during the war it was open to the elements and made a pleasant sheltered space for getting some fresh air. 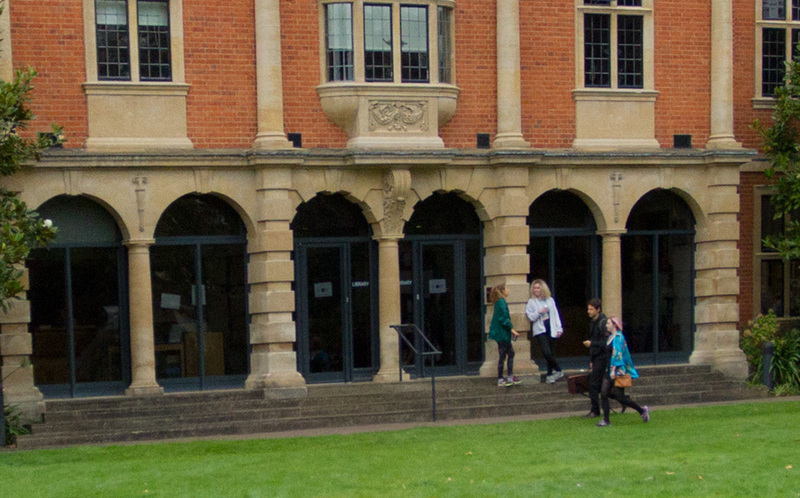 Today the enclosed loggia is used by students as an informal transitional area between the main quad and the quiet study area of the Library. West was the first purpose built accommodation building at Somerville, completed in 1885 by the architect H.W. Moore. It was based across the main quad from Maitland and House and designed to be reminiscent of the country house that many of the women had come from, with large sitting and dining rooms and a formal front staircase. During the war, tents were pitched in the quad outside West to accommodate more patients and a tent can be seen in the background of this photograph. Today West has been renamed Park after former Principal and ‘Queen of Spies’ Baroness Park of Monmouth. 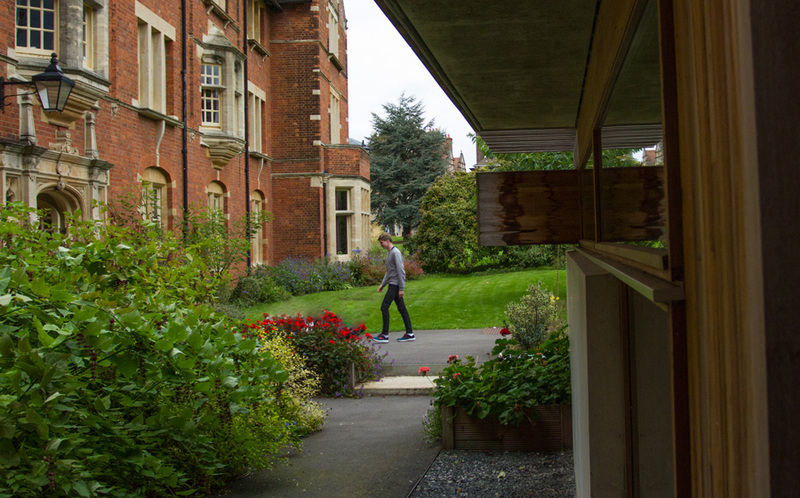 It is still used mainly as accommodation for undergraduates. 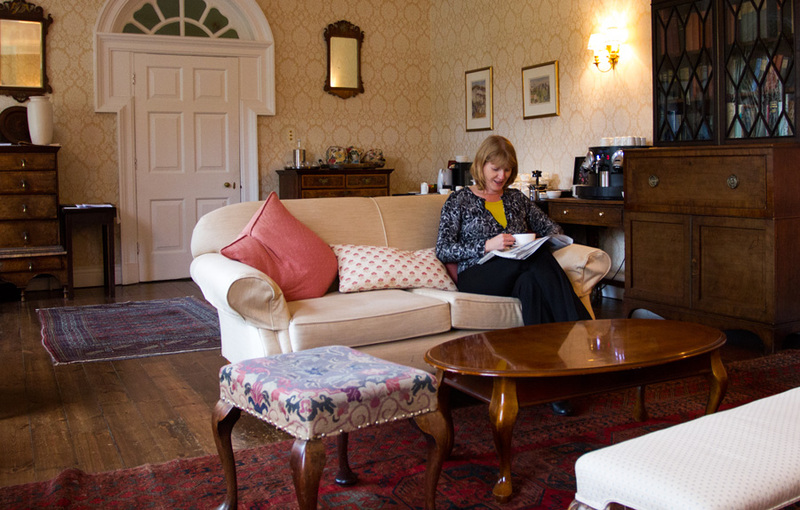 In peacetime, this room was the Senior Common Room (SCR) where the fellows could relax, have tea or gather before and after meals. 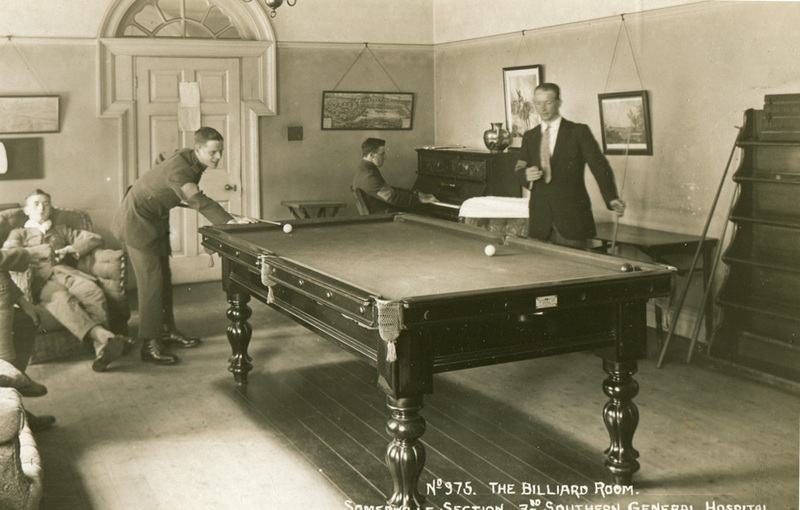 The billiard table was not part of the original furnishings. The SCR is situated beneath the Hall and was one of the rooms in the new Maitland Building (completed 1913). The room is still used as the SCR for the College. This room was originally the dining room for one half of the College. Until 1913 when Maitland Dining Hall was built there was nowhere big enough for the whole college to dine together. So students lived and dined in either this room in Walton House, the original College building or West, Somerville’s first purpose-built accommodation, preserving a family atmosphere. 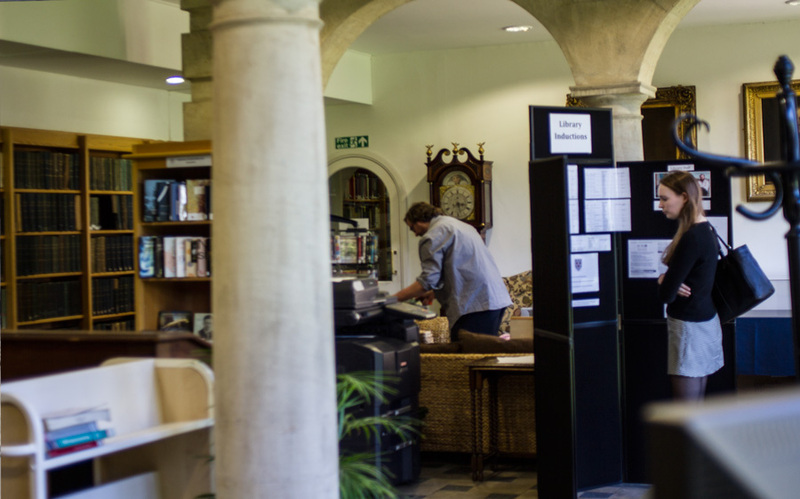 Once it was no longer needed as a dining room, this became a junior common room (JCR). 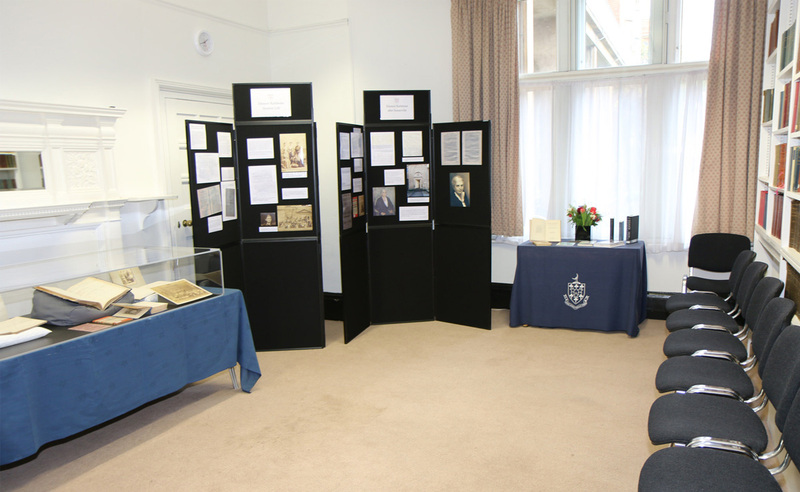 Today this room has been renamed the Mary Somerville Room and is used for informal gatherings, small concerts and meetings. 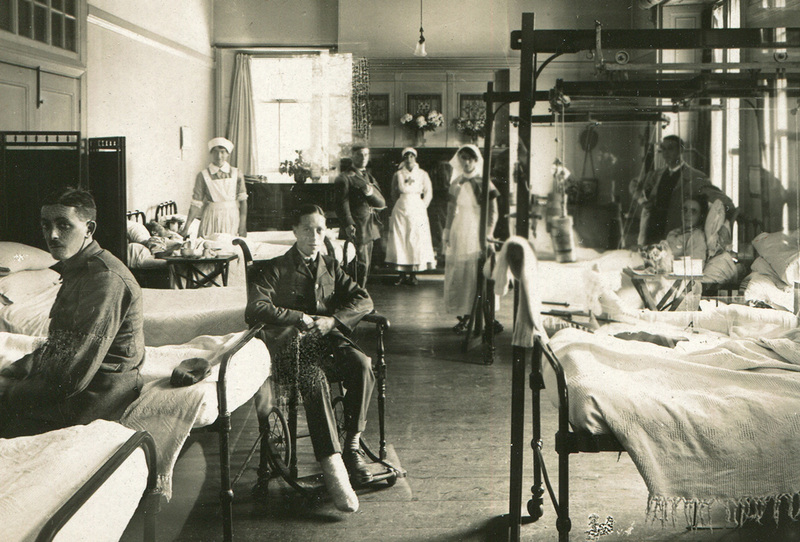 This was one of the larger wards in the hospital and had formerly been the West dining room. It was later subdivided and became a tutor’s room. Today it is a seminar/tutorial room named after Eleanor Rathbone (1872-1946), Somerville’s first MP, whose portrait graces the walls. If you would like to know more about the Oxford at War project, please follow this link. The University is also hosting a community collection day on 12 November, the details of which you will find here.